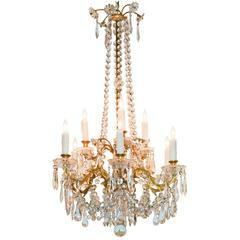 Beautiful 19th century French bronze and crystal 18-light Baccarat chandelier. One of the world’s foremost crystal manufacturers, Baccarat has long been emblematic of luxury and exquisite craftsmanship. Starting in the early 19th century, objects produced by the French company — from stemware to chandeliers to brightly colored paperweights — became a staple of noble and wealthy households across Europe and as far afield as India. Along with the purity and quality of their glass, Baccarat crystal makers can boast a remarkable fluency with a range of design styles — from cut-glass Neoclassical pieces to sinuously etched Art Nouveau designs. Baccarat began as a kind of industrial development project. In 1764, the Bishop of Metz and other landowners in heavily forested northeastern France persuaded Louis XV to sanction a glass works in the area — timber being a key resource required for the furnaces used in glass production. In its early years the company produced humble products such as window panes and simple drinking vessels. In 1816 a new owner began making crystal, and seven years later Louis XVIII — who had taken the throne after the defeat of Napoleon — gave Baccarat its first royal commission, for tableware. In ensuing years, an estimated one third of the company’s workforce was dedicated to commissions to the Russian imperial court alone. Spurred by the intense competition between global industries in the latter 19th century — fought in public view in the many world expositions of the era — Baccarat elevated its level of artistry by adopting new technologies and creating a rigorous training program. The firm broadened its stylistic range, embracing Asian influences and new engraving methods, and increasing production of its now iconic millefiori paperweights. The designer George Chevalier, who worked for Baccarat for more than five decades beginning in 1916, ushered the company into the realm of Modernist design. In recent years, Baccarat has employed such renowned contemporary designers as Philippe Starck and Marcel Wanders, ensuring that Baccarat crystal will continue to enjoy pride of place on up-to-date tables. But as you will see from the offerings on these pages, Baccarat has items to suit any taste. Beautiful 19th century French gilt bronze and crystal 4-light chandelier. Lovely late 19th century French bronze and crystal 6-light basket form chandelier. Outstanding 19th century French Empire bronze 12-light chandelier.